Bamang Mangha dedicated children science park to students of Kimin. 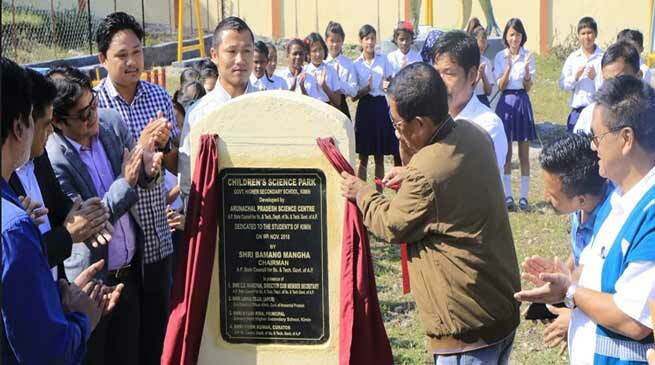 Arunachal Pradesh state council of science and Technology (APSCS&T) Chairman Bamang Mangha today dedicated a Children Science Park at Govt. Higher Secondary School Kimin for the students of Kimin. In his Inaugural address Bamang Mangha spokes the motto behind setting up of this facility is to promote science education with fun. Person can acquire his 80% of knowledge through experience and it is true for science also. Director Science &Technology C.D. Mungyak while speaking on the importance of knowledge and play, he urges the teachers to allow students to spend their free time in play ground, it promotes learning and creativity. Development of Children Science Park is a small step towards initiative taken up by Dept. of S&T to promote Science Technology, Engineering and Mathematics (STEM) among the students of State. He inform that This is second of its kind while the first children park inaugurated recently at Government Secondary School Joram in Lower Subansiri district on October 2. Kimin, SDO Likha Tejji, urges teachers to use the science park regularly for demonstration of basic principles of physics such as lever, pendulum, size and distance etc. He urges the students and teachers to use the facility with utmost care to reap maximum benefit from the science –park. A robotic show was also organised during this event by A.P. Science Centre.